Start browsing the site and find different items that would make sense to buy together if you were a consumer. Some examples would be a dorm room kit, a camping kit, or a grill kit, let your imagination run wild! Once you have decided what type of bundle you would like to create search the site for items that would work with your bundle. If you are creating a camping kit, start with a search using the search bar, so type in camping. Add items to your cart that would be good for the bundle, make sure that the total amount of each product is the same, so if you have 30 frying pans, add 30 lanterns, or 30 camping saws so the bundles are equal. It is time to checkout! Press the green checkout button at the top right of your screen. Once you are here, press the Proceed to Checkout button. Please note that many items have assorted colors, so if you want to bundle these items you must create your Amazon listing with that notation, we will not separate colors out, so if you want only the blue, when there is a red and a green, we will not bundle just the blue. If you have not registered please do so now, and select a sales representative. This is the person that will be your point of contact and help you thru the process. When the order is placed both you and your sales rep will receive an email of the sales order. On that email you will find your sales representative’s contact information including email address. Once you have done this it is time to continue the checkout. 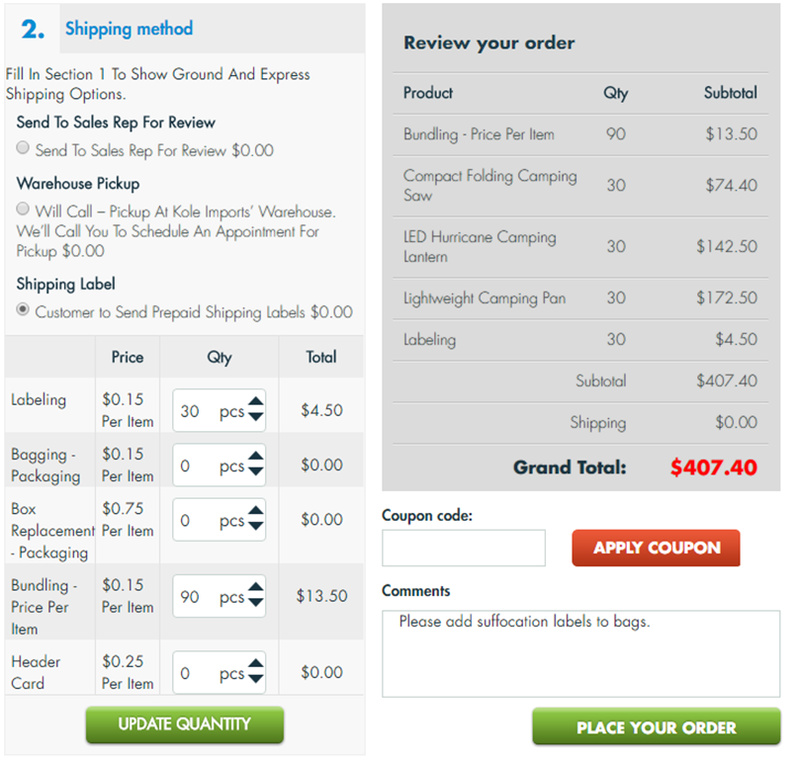 When it comes to shipping method, you must choose Shipping Label (Customer to Send Prepaid Shipping Label $0.00). You will see a magic box show up with additional services that we provide. In the bundling box put the total amount of products that will be bundled. So in our case we have a total of 90 items, 30 pans, 30 lanterns, and 30 saws. The bundling charge includes, labor, a poly bag that we will put the items into and a UPC label that we will print and attach. If your bundle will require a bag which has an opening larger than 5 inches (most will) then you will be required to add a suffocation label to the bag. On the dropdown you will enter the total amount of bundles into the labeling box. In this case, I have 30 bundles, so I will enter 30 into the labeling box. Inside of the comment box please let type that you will need suffocation labels. Enter your credit card information, or click the PayPal Express checkout and enter your PayPal details and press the PLACE YOUR ORDER button…you are finished! Apply a new FNSKU barcode onto the existing packaging of your product. A new FNSKU will allow you to create a new item listing on Amazon for your item where you will have total control of the title, description, images etc. You can also list the item with the existing UPC on the package in which case you will have to sell on the existing product page where you may or may not have control over the product information. If sending FNSKU barcodes they should be in the standard format you download from your Seller Central account. These should be formatted to print on 2 5/8” x 1” address labels that come 30 per sheet. Apply a logo sticker with your own brand onto your product. If sending a logo it should be saved as a jpeg or png file and formatted to print on a 1.5” x 1.5” square sticker. If you are looking for a logo sticker of a different size or shape then you would have to get those made off site and physically mailed to us. Apply a suffocation warning label. Certain size poly bags will require a suffocation warning which can be applied using the labeling service. This service is offered for $0.15 per label. If you are ordering 24 pieces of an item and need just FNSKU barcodes applied, you would put 24 pieces under the Labeling quantity. If you ordered the same 24 pieces and wanted both an FNSKU and logo applied, you would put 48 pieces under the labeling quantity. If you also need to add a suffocation warning label, you would put 72 pieces under the labeling quantity. When doing check out, it should look as the image below . We understand about getting products to your customers that are fragile, so we have included bubble wrapping as part of our FBA services. Although not widely used, we can bubble wrap items prone to breaking. Examples would include mirrors, picture frames, clocks, ect. Amazon will typically tell you if it is a requirement for the item, at which time we can assist. Bubble wrapping is an inexpensive way to protect the product, and make a customer happy. If you are in need of bubble wrap, simply write an email or call your account manager and tell them that you need bubble wrapping on your purchase. Your account manager will create a separate charge and arrange for your products to be wrapped. The fee for bubble wrapping is $.20 per item. With our package replacement options you can take your products to the ultimate level of customization. This option is great to further differentiate your products, build up your own brand recognition and help eliminate competition on your listing pages. For a low quantity commitment, you can get products onto Amazon in your own packaging that is essentially no different than sourcing direct from the manufacturer. Our most popular options are box replacement, wrap replacement and header card replacement. We charge $0.75 per box and $0.25 for wraps or header cards. These would have to be produced off-site and mailed here to your sales reps attention. Once received, we will start prepping and ship out your order within 3-7 business days. The box replacement option can be used for any items that come in a cardboard box. We can also potentially put items into boxes even if they are not currently packaged that way. It is best to talk to your rep about this. Wrap replacement is typically limited to items like blankets (see examples OL636 and OF789 ). The header card option is best for items that come in poly bags, they can be single items or items you choose to bundle together.